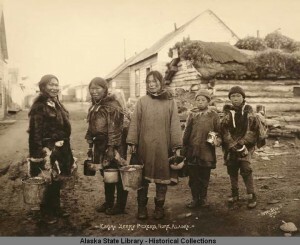 Eskimo berry pickers, Nome, Alaska, circa 1910. ASL-P28-032, Lomen Brothers Photograph Collection, Alaska State Library. In April 2015, the board of directors of the Alaska Historical Society endorsed the History Relevance Campaign‘s statement about the value of history. The History Relevance Campaign serves as a catalyst for discovering, demonstrating, and promulgating the value of history for individuals, communities, and the nation. The campaign promotes the idea that history can have more impact when it connects the people, events, places, stories, and ideas of the past with people, events, places, stories, and ideas that are important and meaningful to communities, people, and audiences today. IDENTITY » History nurtures personal identity in an intercultural world. History enables people to discover their own place in the stories of their families, communities, and nation. They learn the stories of the many individuals and groups that have come before them and shaped the world in which they live. There are stories of freedom and equality, injustice and struggle, loss and achievement, and courage and triumph. These varied stories, they create systems of personal values that guide their approach to life and relationships with others. Go to www.historyrelevance.com to learn more about the History Relevance Campaign, their projects, or to endorse their value statement.